Just like Dory in ‘Finding Nemo’, all of us love to just keep swimming (we know we do). Keeping that in mind, here are some of the best water parks Mumbai has to offer you. Soak it all up at India’s largest and oldest water park, Water Kingdom. Situated in Gorai, it’s at close proximity from the city limits. 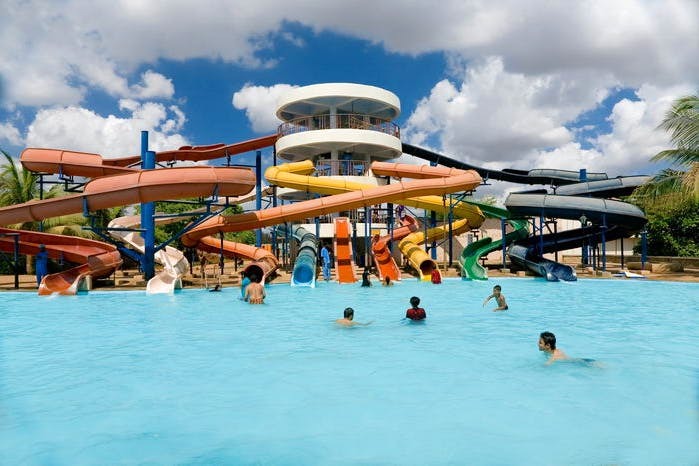 Rightfully ranked as one of Asia’s largest water parks, it boasts of a giant wave pool, adventure rides and slides, for a completely refreshing and unique experience. Open throughout the year, there’s no denying that it’s one awesome place to beat the heat. Price: INR 1,310 for adults, INR 865 for kids and INR 865 for senior citizens. Situated near Khopoli on the Mumbai-Pune Expressway, this is India’s most luxurious water park spreads across a massive 300 acres. With its international rides and themes, it’s a family must! While you’re there, just go with the flow, and don’t forget to experience Loopy Whoopy, Swirl Whirl and Yell-O (think twists, turns and a whole lot of screaming)! Price: INR 999 for adults and INR 799 for children on weekends. They have separate pricing for weekdays, peak season, express tickets and special deals. Do check ahead of booking. Located on Thane’s Ghodbunder just beyond Kasarvadavli, Suraj Water Park may not be the biggest, but it offers some lovely rides that makes it a perfect for a weekend outing with family. One of these is the Har Har Ganga - a statue of Shiva with the Ganga originating from his hair, which over here, has water slides for kids. Also, there are some interesting seafood restaurants near the area to enjoy after some fun in the pool. Like Suraj Water Park, Tiku-Ji-Ni-Wadi is located in Thane, but closer to the Eastern Express Highway, near Manpada. It’s one of the oldest water parks and was a popular getaway in the 90s when its only rival was Water Kingdom. Although several water parks have sprung up, Tiku-Ji-Ni-Wadi has its own charm and has several visitors every weekend. Price: INR 750. Food is priced at INR 250 for the unlimited veg thali and INR 150 for snacks. Leave the cacophony of the city behind and treat yourself to a unique experience with water rides and slides amidst the lush-green hills of Virar. Spread across 12 acres, it’s the perfect place to satiate your thirst for some fun. If you want a fun family adventure, Shangrila is just the place to be. Situated near the Bhiwandi-Kalyan junction and spread across a huge 15 acres, Shangrila boasts of exciting water games, apart from the usual aqua-venture. Price: INR 700 for adults, INR 650 for children for entry. If you prefer a package deal, there are packages available with food included at INR 1100 for adults and INR 1000 for children. Experience the joy of both – a water park in the city, and the beach life, with Anand Sagar. The resort is well connected to Arnala beach, North of Mumbai. So, indulge in some fun water activities or spend some time relaxing on the sandy beach, you have a lot to choose from. Save some time and hassle by booking your tickets online.